The International Association for the Advancement of Space Safety has announced that this year’s Vladimir Syromiatnikov Safety-by-Design Award will go to Space Exploration Technologies Corporation (SpaceX) for safety accomplishments related to its Dragon vehicle. The award will be received at the 7th IAASS Conference Awards Gala Dinner by SpaceX Director of Risk and System Safety Michael Lutomski. Vladimir Syromyatnikov in May 2006 (Credits: Alexander Gronsky/agency.photographer.ru). The Vladimir Syromyatnikov Safety-by-Design Award honors outstanding designers and engineers who have made major technical contribution towards systems safety. It is named in honor of Vladimir Syromiatnikov (1934-2006), the Russian designer who created the Androgynous Peripheral Assembly System (APAS), a unique docking system which linked the U.S. Apollo and Soviet Soyuz space capsules in the 1970s. 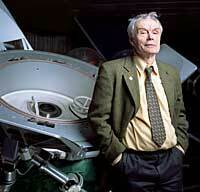 In the 1990s he updated his docking system for the meeting of the Mir space station and the Shuttle Atlantis. The APAS is also used on the International Space Station and formed the basis for the new global standard, the International Docking System Standard (IDSS). SpaceX is being recognized with this award for being the first space commercial company to achieve safety certification of its Dragon vehicle in accordance with NASA and FAA rules, and successfully performing multiple resupply missions to the International Space Station. IAASS also acknowledges SpaceX’s pursuit of innovative design solutions for its new Dragon V2 vehicle for higher performance and enhanced crew safety, in particular during safety-critical mission phases. Lutomski will receive a solid bronze statuette representing Athena wielding a silver shield. In the Greek mythology Athena is the goddess of wisdom, science, courage, inspiration, civilization, strength, strategy, justice, skills and shipbuilding. The shield of Athena, called Aegis, represents in this award safety knowledge and carries an image of the APAS docking system, as a symbol of international cooperation. – In the video below, an artistic conception of the manned Dragon 2 capsule. Lutomski himself has spent nearly 30 years working on human spaceflight programs at NASA and in private industry. In the mid-90’s he spent two years working in NASA’s Moscow office supporting early space station operations infrastructure development. For 10 years Lutomski served as Risk Manager for the International Space Station (ISS) Program. As Risk Manager he was responsible for defining and implementing the qualitative and quantitative risk management processes across the organizations and international participants of the ISS Program. He retired from NASA in 2013 and joined SpaceX. Lutomski co-authored the IAASS book Safety Design for Space Operations, published in 2013 by Elsevier. The 7th IAASS Conference Safety Is No Accident will take place October 20-22 in Friedrichshafen, Germany. The FAA does not certify commercial spacecraft for safety and nothing I’ve heard suggests that NASA has done so either. I bet you can google your way out of your own ignorance.